The Katadyn BeFree water filter bottle is here to keep you hydrated while on the move. When stream crossings are plenty, but water quality is questionable, the BeFree filter will ensure that your jaunt through the woods won’t be followed by agonizing and frequent runs to the loo. Ultralight, compressible, easy to clean, and sporting a hearty flow rate, the Katadyn BeFree is a soft water bottle and filter combined. It’s our Budget Pick for the Day Hiker and Car Camper — for Day Hikers with frequent access to water during their hikes, and Car Campers who like a portable water bottle that filters without a second thought. The Katady BeFree is a unique water filter and water bottle hybrid, and you get both for one purchase. The water filter part of the BeFree is in the cap, which has a hollow fiber filter attached to it. Simply fill the bottle, shake it around, and drink out of the bottle to filter your water! The bottle itself is a high-quality plastic that’s tough yet soft, so when it’s empty you can collapse into a tiny corner of your pack. The Katadyn BeFree has a surprisingly quick filtration rate, and is crazy simple to use. Paddle your way through our sea of expertise on water filters and purifiers with our comprehensive guide, and see why we recommend the Katadyn BeFree below. Update: Since this review Katadyn has release larger bottle sizes of the BeFree, including a 1 liter system specifically for backpacking and 3 liter system that’s designed as a gravity filter. The filter itself screws onto any of these sizes, and the flow rate is still very high. Weight 2.33 oz. (66 g) A bit above two ounces for a water bottle and filter. The filter cap alone weighs 1.59 oz. (45 g). That’s light. Filter or Purifier? Filter Filters particulate, protozoa, and bacteria. More information on the difference between filters and purifiers in our Guide. Treatment Type Squeeze Squeezing the bottle pushes water through the filter at a very high flow rate. Effective Against Bacteria and Protozoa Keeps your tummy feeling good, but will not remove viruses. This is best for backcountry water sources in the U.S.
Filter Pore Size (Microns) .1 microns You can’t see pathogens, but they’re there. The BeFree filters to the industry standard. More details in our Guide. Filter Media Hollow Fiber You can see the fibers in this filter, which is cool. Pretty standard filter media, but don’t use it in sub-freezing environments. More on filter media in our Guide. Flow Rate 2 L/min The standout of the BeFree is its flow rate. The water practically leaps into your mouth. Filter Life 1,000 L Not the best filter life. The bottle is .6 L, so you can use it roughly 2,000 times before you need a replacement. Filters Particulate? Yes Removes sediment and other bits from water. Won’t have a huge impact on taste though. .6 L Hydrapak water flask Just two parts, which screw into each other. Easy. Works With Hydrapak Seeker reservoirs The BeFree filter has proprietary threads, which means it doesn’t work with many other systems. Hydrapak makes the Seeker series, which are compatible. Manufacturer Warranty 2 Year Manufacturer Guarantee Katadyn offers a two year “guarantee”, but doesn’t give much information on it. They are a reputable company, but the variable nature of water filters, water sources, and a short filter life makes claims difficult. If it breaks super easily get in touch. Cost $39.95 A low cost for a water filter bottle combination. Let me start by saying that I love trail running. When flying down a trail — heart beating, lungs expanding, legs burning — I feel a sense of mental clarity and inner peace. It’s such an integral part of my life and well-being that I make it out for a short run a couple times a week. That said, it’s those long trail days I crave; the ones where I get to unplug from the world for hours on end. On the shorter runs I don’t carry any provisions with me — I’ll be back at the car soon, and don’t like the feeling of water bottles and gear bouncing around on my back while navigating technical trails. However, on longer excursions, I try to carry as little as possible while still bringing everything I think I may need…especially water. How much water I choose to bring depends on how frequently I can get to any natural bodies of water along the trail. If I’m out running for hours, I’ll need to have some water with me, but if there’s regular access to streams and such along my route, I can get away with just a lightweight water filter. This kind of scenario is where the Katadyn BeFree water filter bottle shines. 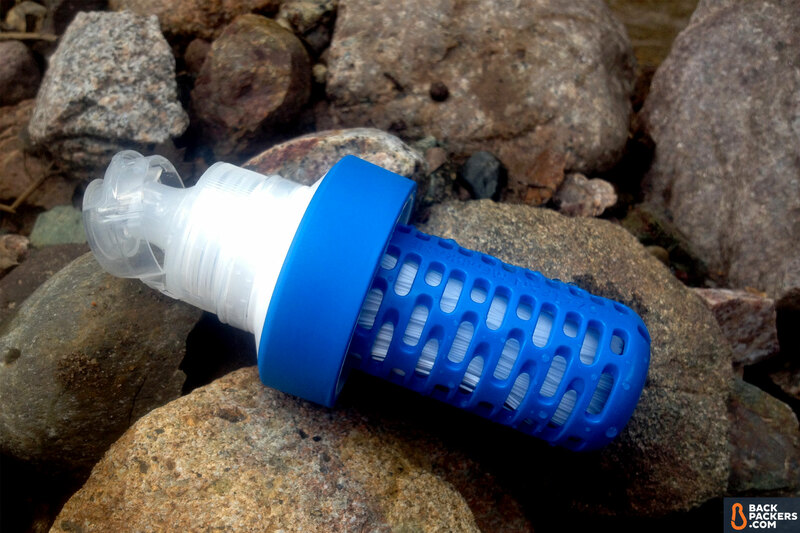 The BeFree: a water bottle filter from Katadyn. Over the past few weeks I’ve been taking this water filter with me everywhere; I wanted to experience its nuances in as many situations as possible. Although I didn’t really need to carry a water filter on some of my shorter trail runs and hikes, I still wanted to see how the BeFree operated as a water bottle — that’s half of its charm, and it can save you the purchase of a separate bottle if you want it to. The last couple months here in Southern California we’ve had one of the wettest winters in years, turning our dry creek beds into beautiful babbling brooks. This allowed me to lighten up my water load for longer runs and put the Katadyn BeFree to the test. I parked my car at one of my favorite trailheads in the Santa Monica Mountain Range, slipped on my barefoot running shoes, took a couple swigs of water, and picked up the BeFree. Starting off at the main trail, I whizzed by shady oaks and fragrant sage scrub in the crisp canyon air. Cutting off from the main trail, I turned onto one of the many single tracks and came to a stream crossing, which is normally a dry creek bed. I stopped to fill up the Katadyn BeFree, simply unscrewing the filter from the collapsible bottle. I held the empty bottle against the current and it was full in about two seconds flat. A wide mouth and small bottle means pretty quick filling. Screwing the filter top back on, popping up the cover of the mouth piece, and giving a light squeeze to the bag, I received a full shot of water, smiled, and was on my way. I ran, sipped, and ran until I reached my desired peak, where I polished off what remained in the BeFree. After resting and feeling sufficiently hydrated, I collapsed the BeFree into the palm of my hand and booked it back through the canyon. The Katadyn BeFree water filter bottle is about as simple as it gets: the filter is attached to the threaded lid, which screws onto the soft water bottle. You unscrew the lid and scoop up dirty water, then drink straight from the bottle when you’re thirsty. Two parts, which fit together — that’s it. The bottle holds .6 liters, which can be both a blessing and curse, depending on your situation. The small form factor makes it easy to hold with one hand while running, and quickly stashable in a backpack. Of course, it also means you can’t grab much water. When full the BeFree holds .6 L of water. That’s just right for some, but not enough for others. As such, the BeFree is designed primarily as a collapsible water bottle filtration device for trail runners, but it works well for day hikers on extended hikes. This is especially true if you have frequent access to water sources, since its size limits how much water you can carry. High quality, collapsible plastic makes this a unique choice. If you need to filter larger amounts, you can always use the BeFree as a scoop, then squeeze the water into larger bottles. This is easy because it has an incredibly quick flow rate, but also awkward as it requires you to actively filter and manage the second water bottle. Most of the time, I’m filtering water on the trail only so I can fill up my bottles for the long hauls between natural water sources while hiking. The BeFree allows you to do that, but also gives you the option of short, frequent filter processes for immediate (or almost immediate) drinkage. It’s hard to get easier: the BeFree is just the filter with a mouthpiece and the soft bottle. There are two parts, and no extra components or loose pieces for maintenance. For cleaning, you can either shake the filled water bottle to dislodge any particles from the filter and then dump it out, or you can remove the filter and swish it around in a stream, both of which are super simple. For a more thorough cleaning, you can remove the filter from the bag and backflush it right under a clean tap. Cleaning instructions are so simple they’re printed right on the bottle. The soft bottle is produced by Hydrapak and seems pretty tough overall, without any obvious weak points in its construction. All the seams appear well-crafted and well-placed. The bottle is made from a very malleable yet thick BPA-free plastic that looks like it could withstand minor abrasion. I wouldn’t, however, get it anywhere near sharp-looking branches or jagged rocks. It’s a soft water bottle and will puncture in the right circumstance, which could be a major problem if you’re in the wilderness and depending on this device to keep you hydrated. The top of the bottle is made from much stiffer plastic, which appears to be a well-designed connection. Finally, the fibrous filter membrane is protected by a hard plastic cage to keep the delicate fibers from getting damaged. Katadyn even writes in its user manual never to touch the fibers. It’s really easy to test the filter for damage: try to blow air through the mouthpiece. If you can’t push air through it, then the filter is in good shape, but if you can blow air through it then the filter is broken and should not be used. The filter and cap by itself. You can see the fibers in the plastic cage…don’t touch them! The BeFree is a very portable filter. I used it mostly in hand as a small water bottle, which was a lot like having my own personal goat udder. As I consumed the water, the bag shapeshifted, which meant I had to get creative to hold onto it. This is tough in freezing weather (with icy water), as the bag itself gets too cold to hold and your fingers will freeze. It’s also a bit awkward as the shape continues to change while you drink from it. When not in use, it’s easy to find a place to house the BeFree. The whole filter can fit within your grasp when the bag is collapsed, is still small when filled, and empty it weighs only 2.3 ounces for the whole shebang. Providing nothing short of a torrent of water, the BeFree can quench even the driest mouth of a thirsty trail-runner. In my opinion, this is the number one selling point of the BeFree. The flow rate is excellent and easy to maintain, and you can clean out the filter while in the field without needing to carry additional tools for backflushing. Even a small squeeze results in a hearty flow. There are a few clarifying things that I feel need to be understood about the Katadyn BeFree water filter bottle. It’s a unique product that will work great for some people, but may cause others a lot of headache, so let’s dive right in. First, let’s talk cost. The BeFree is $40 MSRP: you get a water filter and a small water bottle. Buying both separately would cost you roughly the same if you went with a very inexpensive filter like the Sawyer MINI, or much more depending on your filter and bottle preference. The BeFree claims a filter life of 1,000 liters — with a capacity of .6 liters, that’s roughly 2,000 uses. That’s plenty for a single person, but if you use it to filter for groups it won’t last as long as you hope (and using it for groups is not ideal due to the bottle size). Other filters on the market also have much longer advertised lifespans. The biggest issue at the time of writing is the versatility of the BeFree. Katadyn and Hydrapak teamed up to create a product with proprietary threads. This means you can’t screw the BeFree cap/filter (they are one unit) onto other bottles, connect it easily to water bladders, or attach it to other water carriers. Yes, you can squeeze the .6 liters of water quickly into any other device, but this lack of easy functionality is clear. Nobody uses these threads except Hydrapak, and they only use it on a couple models. Will we see more bottles that the filter can screw onto? This coincides with the other major flaw (or pro, depending on your needs) of the BeFree: its size. Some people — trail runners with access to flowing water — will love a tiny bottle that can be refilled and filtered at a moment’s notice and then stashed quickly in a vest or small pack. But most people carry more than .6 liters of water on them during a day hike. Hydrapak sells the Seeker series of soft flasks, which do work with the BeFree threads, and come come in 2L and 3L sizes. This increases your capacity, but requires you to buy another bottle, which is not ideal. You can purchase the filter/cap on its own for $25 and a Seeker flask that meets your needs separately, but there should really be a BeFree filter in multiple sizes to get the most versatility. Finally, I found the BeFree awkward to hold. It’s constantly collapsing as you drink, and if you’re running while holding it that ends up being strange and overly complicated. If you’re storing and stuffing it into a backpack it makes more sense, and some people may like this, but it wasn’t ideal for me. The Katadyn BeFree is an ultralight, hassle-free water filter and bottle combined into a sleek package. If you have frequent access to water, love a fast filter rate, and value simplicity above all else, check out this water filter bottle. We tested the Katadyn BeFree water filter bottle in the 600 ml form factor. Katadyn also now makes a 1 L and 3 L version. All the bottles are still collapsible, and the filter screws into any of them. The filter can be purchased separately for $25 MSRP. Hydrapak also makes the Seeker reservoirs, which are compatible with the BeFree filter, and come in 2 L and 3 L sizes. We recommend the 600 ml size for day hiking, but if you want a larger bottle or a camp filter, we recommend the 1 L or 3 L size. Compare prices for the different sized Katadyn BeFree water filters below. Obsessed with worldwide wilderness exploration, treasure hunting for pearls of wisdom, and staring into the abyss of the nighttime sky, Jonathan spends his days building his tiny house, hiking daily, testing outdoor gear, and handyman-ing as he quietly plans his next adventure. You are officially invited to join in his shenanigans on YouTube.